After his release from prison in 1960, Greenglass lived under an assumed name in Queens. The Rosenbergs were convicted in 1951 of conspiring to steal secrets about the atomic bomb for the Soviet Union, and were executed at New York’s Sing Sing Prison, insisting to the very end that they were innocent. 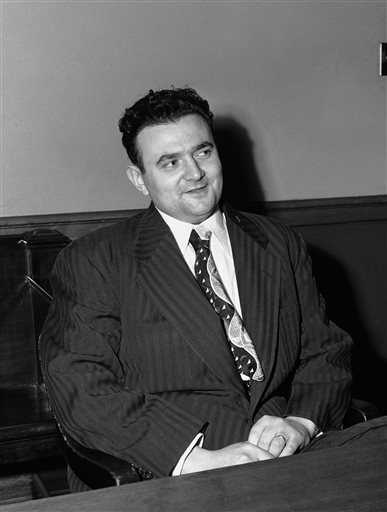 Greenglass, indicted as a co-conspirator, testified he had given the Rosenbergs data obtained through his wartime job as an Army machinist at Los Alamos, headquarters of the project to build the atomic bomb. He told of seeing his sister transcribing the information on a typewriter at the Rosenbergs’ New York apartment in 1945. The testimony proved crucial in convicting Ethel and her husband. In 2001, Greenglass was quoted in the book The Brother by New York Times reporter Sam Roberts as saying he had not actually seen Ethel typing and knew of it only from his wife. For the prosecution, however, the typewriter was as good as a smoking gun. For his part, Greenglass said he lied to assure leniency for himself and to keep his wife out of prison, so she could care for their two children. It’s a story that has Hollywood written all over it. The scoundrel, David Greenglass, was 92. This entry was posted on Wednesday, October 15th, 2014 at 1:53 am	and is filed under Blog by Manny Pacheco. You can follow any comments to this post through the RSS 2.0 feed. Responses are currently closed, but you can trackback from your own site.